Social media serves an important role for any online marketing mix today. With so many social media platforms, managing a business’s marketing initiatives on each one is time-consuming, making it hard for brands to know where they should focus their efforts and how to prioritize the different sites they’re marketing themselves on. So which social media platforms should be given marketing priority for a business? The answer varies based on one key factor: your target audience. To help clarify where you should put more of your attention and budget, we’ve compiled insightful data on which audiences are hanging out on which social media platforms. Pretty much everyone. Facebook is still the biggest player in the social media space and a platform most brands need to have a presence. The site has 2 billion monthly users. 76% of Facebook users visit the site every day. Women use the site more than men. 83% of women use Facebook, while only 75% of men do. Clearly, you can reach both men and women through Facebook, but brands trying to reach women have good reason to give the site extra priority. Most age groups are well represented on the platform. 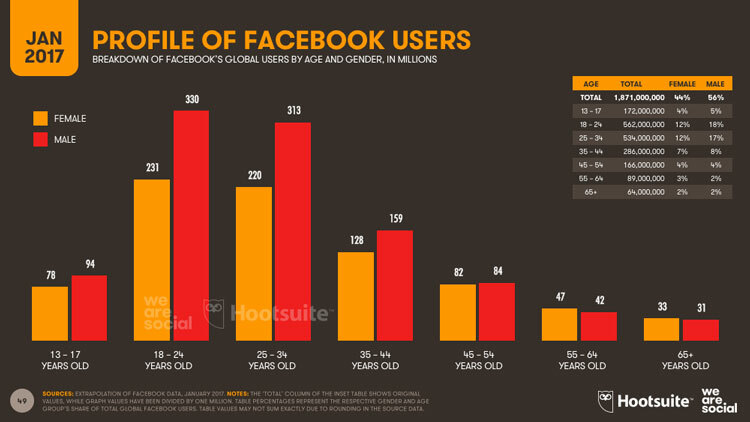 Facebook rules other social media sites in almost every age demographic. They have the most users in the 18-29 age range at 88%, but still claim 84% of people age 30-49, 72% of those who are 50-64, and even 62% of those over 65. The main age group where Facebook lags are those aged 13-17, who vastly prefer Snapchat. A larger proportion of users are highly educated and high-income. 77% of people that have attended or graduated from college are on the platform are on Facebook compared to 56% of those who stopped their formal education at or after high school. Higher income brackets are also more active on the platform, with 76% of individuals earning over $75,000 compared to 65% of those earning less than $30,000. Twitter gets a lot of attention in marketing circles, and rightly so. While its user numbers aren’t as high as some of its competitors, Twitter’s data shows that over 66% of people on the platform have discovered a small or medium-sized business on the platform.A staggering 69% have chosen to make a purchase because of content they saw on the site. At this point, it’s a place many brands are simply expected to have a presence. How many people are on Twitter? The site has 328 million monthly users. 42% of Twitter users visit the platform daily, and another 24% visit at least once a week. Younger demographics are most active. The biggest age range making up Twitter’s demographic is once again those ranging from 18-29, with 36% of all people in that age range on the platform. From there, it drops down to 22% for those 30-49, 18% for people 50-64, and a scant 6% for those over 65. There’s a higher proportion of users with advanced education and high incomes. As with Facebook, those in the upper-income brackets, with at least some college, use the platform more than those with lower incomes and less formal education. Twitter boasts a large international audience. 79% of Twitter’s users are based outside of the United States, with especially high user counts in Brazil, Japan, and Mexico. If your brand sells products internationally, this may be an important platform for you. While marketers traditionally give a lot of attention to Facebook and Twitter, Snapchat has quickly become one of the biggest social media players out there. Its numbers are higher than Twitter’s and its users are engaged. For many marketers, this mobile social platform can’t be ignored. How many people are on Snapchat? The social app now has 700 million monthly users. Frequently. Snapchat released data revealing their users visit the app an average of 18 times a day. The biggest demographic trend to be aware of on Snapchat is probably one you could guess: the users are young. They have a larger market share for users 13-17 than any other platform by a sizeable margin. And the app’s younger users visit the platform more often than older ones—those under 25 years old log on an average of 20 times a day, whereas those over 25 average 12 times a day. That said, the number of older users is growing. Last year, more than half of all people who signed up for the app were over the age of 25. More women use Snapchat than men. In one survey, 42% of women said they used Snapchat in comparison to 31% of men. Snapchat has an international base. In fact, it has more users in Ireland, Saudi Arabia, and Sweden than it does in the United States. Instagram follows behind Facebook in the numbers of users, claiming 28% of the population. The image-based social media platform attracts a variety of users and is reported to have a higher engagement rate on its posts than any other platform. The site has over 600 million active users. Over half of Instagram’s users visit the site every day, and over a quarter visit at least once a week. More women than men use the platform. While this is the case on several other platforms as well, the difference is more significant for Instagram than Facebook, with 32% of women on the platform versus 23% of men. Users from all income brackets are common. While there are some slight differences in percentages of users from different income brackets, the distribution is fairly close across them all. The user base is international. This is another case where the majority of users are international. 80% of Instagram users live outside of the United States. This professional social network is used differently than the others but still shares some similarities to other social platforms in demographic trends. For many businesses, but especially B2B ones, this platform is likely relevant to your advertising efforts. How many people are on Linked? Linked announced reaching the 500 million user mark earlier this year. How often do people visit? As you might expect for a site more focused on business than entertainment, people don’t visit as frequently as they do for the other social media platforms. Only 18% of users visit the site each day and 31% visit weekly. Over half say they visit less often than that. Though it’s easy to assume LinkedIn to be dominated by older age ranges with lower participation on other platforms, the younger demographic still dominates. 34% of all people ages 18-29 are on the platform, in comparison to 31% for those 30-49 and 21% of those 50-64. Higher income levels are more represented. 45% of people making $75,000 or more are on the platform; in comparison, only 23% of those making less than $30,000 are. More men use the platform than women. This is the first example on this roundup of data where this is the case. But the difference in numbers isn’t all that significant: 28% of men to 23% of women. Place more focus on platforms representing your target audience. There’s a lot of overlap for who’s using which platforms, so you will likely need to have a presence on several of the social media sites, if not all of them. That said, knowing which platforms your target audience is the most active will help determine where to prioritize spending budget and time. Target marketing initiatives to audiences on the platform. Each platform is different. In addition to making sure your approach to each is tailored to the strengths of the platform, you also want to think about what audience you’re reaching and create marketing messages likely to appeal to them. Pay attention to your own analytics. The data shared in this post is useful, but as you spend more time on different social media platforms, you’ll learn even more valuable information through your own analytics. The larger audience on each platform is less important than what works for your audience specifically. Always pay attention to the data and refine your efforts based on what you learn. Social media marketing is competitive, but it’s easier when focusing on speaking to those you most want to reach. Look for where your target audience is and place efforts on reaching them. Brands must strive for focused, targeted initiatives to get results.